Find out what astronauts eat in space. Do you eat bark with your porridge? Find out about cinnamon, a spice made from the bark of a tree. Find out about a scale used to measure the heat of different types of chilli. Find lots of answers to questions about food. 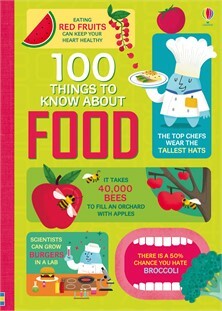 Watch a video with lots more fun food facts. Find out how your tongue works. Should we eat bugs? Discover the benefits of a bug diet. Find out where salt comes from and why your body needs it. Watch a video clip about why your stomach rumbles. How do vitamins work and why do we need them? Where does chocolate come from and how is it made? Find out how microbes can make good - or bad - foods. Discover the chemistry behind baking. How do bees and pollen help make strawberries? Explore strange fruits from around the world. Watch a short video about lab-grown meat and how it's made. Find out how rationing changed what people ate in World War II. Watch an experiment about how to extract iron from breakfast cereal. Which foods can be sent into space for astronauts to eat? Put your nutrition knowledge to the test and sort foods into correct groups. I loved the food superheroes. The page where the fruit got arrested was really funny!